As 2018 comes to a close, its safe to say this year has had its fair share of surprises, movies that met expectations, and some the were flat out disappointments. Having said that, next year will surely be no different, but right now every movie has a clean slate to start with. While I have pretty much no knowledge of which movies will actually end up being my favorites next year, I do know which ones I have marked on my calendar. As usual, for a movie to make this list I probably have to know at least a little bit about it, so don't expect any secret Oscar movies that don't even have a plot synopsis here. Instead expect a list filled of remakes of Disney classics, projects from the best directors in the business, and of course plenty of superhero movies. Last year this spot was given to Bohemian Rhapsody, so it's only fitting it now goes to Rocketman. The film will be based on Elton John's life and will serve as a concert movie like Rhapsody did, but will apparently be capitalizing on that even more. Rather than being a realistic biopic, it'll be incorporating fantasy elements and visuals specifically during the musical performances as was shown in the trailer. The movie was originally going to star Tom Hardy as Elton, which personally would've been even more exciting and interesting that what we're currently getting. But it seems they've found a worthy successor in Kingsmen's Taron Edgerton, who can even actually sing. With Dexter Fletcher who directed Rhapsody also behind the camera for this project, I'm expecting another fun time at the movies from this one. Funny enough, this was actually higher on the list before the first official stills from the movie were released a few weeks ago. Director Guy Ritchie has a tough task ahead of him adapting such an iconic childhood movie for so many people, but the first trailer managed to bring back all that nostalgia. Unfortunately, fans already have their doubts about this adaption of the movie. Probably the biggest criticism has been of Will Smith's appearance as the Genie, although the actor insists he will be blue in the movie. The task of filling in the shoes of the legend Robin Williams is pretty major, but Smith is probably one of the only people funny and charismatic enough to come close. I have to be honest here, I'm not the biggest Quentin Tarantino fan. While I loved movies like Django Unchained, the director lost me with his latest effort Hateful Eight. But there's no denying the mans talented and brings a style of his own to all of his movies, and thats sure to be the case with this adaption of the Charles Manson murders. I'm not sure how much freedom Tarantino will have the story, as this is the first time he'll be adapting a real life event to the big screen. It'll be interesting to see how he manages to take it his own way, while still staying true to the real victims. But the real selling point here is the star-studded cast led by Brad Pitt and Leonardo DiCaprio is the first time on screen together. The supporting cast includes the likes of Margot Robbie, Al Pacino, Emile Hirsch, and Bruce Dern which is just more reason to believe we'll be seeing this one around during the Oscar next year. During the days when I would watch Key and Peele sketches with my friends in high school, never would I have thought Jordan Peele would be an Oscar winning horror director. A lot can change in seven years. After how impressive his first effort Get Out was, Peele definitely has a tough act to follow. Re-teaming Black Panther standouts Winston Duke and Lupita N'yongo is already a step in the right direction, and Peele seems to be tackling a whole new story here rather then relying on the same themes from Get Out. Its still hard to tell what exactly the movies about, but with Peele's creative mind behind this one he's surely going to find a way to mess with audiences heads when Us hits theaters. Almost as rare as having a horror movie directed by a sketch actor on this list, is having a movie from the guy who made The Last Airbender to follow it up. While M. Night Shamalayn had become a bit of a joke to many movie goers, some of us still remembered the days when he created great movies like The Sixth Sense, Signs, and Unbreakable. Well last year's Split seemed to be a return to form for the director, and with a twist revealing the movie was actually connected to Bruce Willis character David Dunn from Unbreakable. Now Shamalayn has the challenge of merging the two worlds he created in these movies, and balancing the screen time between three great actors. With Bruce Willis, Samuel L. Jackson, and James McAvoy all sharing the screen for this one, Shamalyn will have a lot on his plate. We're rooting for you man. I never thought I'd have an MCU movie so low on my list, but here it is. To be fair, I don't know much about the character of Carol Danvers to begin with so that's part of the reason why I'm still not so excited for this movie. That being said, when the plot details for this movie were announced at Comic-Con a few years ago I was sold. Setting in the 90s with a young Coulson and Nick Fury, as well as having the Skrulls finally on the big screen was enough for me. But the trailers for this movie have yet to impress me and most fans, and have made both the character and plot seem much more bland than we were expecting. Thankfully some extended footage shown a few days ago helped relieve some of those concerns thanks more lines for Carol and Fury, as well as more footage of the Skrulls. I can only hope this movie surprises me and makes me love and care about a character I don't know anything about like Guardians of the Galaxy did. Forget trying to figure out what exactly DC is doing with their film universe right now, but we have somehow grasp the concept that this movie has nothing to do with that. Set in the 1980s, Todd Phillip's Joker movie will have nothing to do with Ben Affleck's Batman, and will actually only feature Bruce Wayne as a child. While the project seemed unnecessary at first, the casting of Joaquin Phoenix as The Joker managed to peek everyone's interest. Jared Leto's Joker has been panned by fans, so it shouldn't come a surprise that they've been much more welcoming to Phoenix. The set photos and videos alone is what really sold me on this one though, with flashbacks to Heath Ledger's Joker coming to mind. With all the talent that will be joining Phoenix on screen, and the mystery and complexity of this character's past, its certainly one of the most interesting projects of the year. The first IT movie caught a lot of people by surprise, and the child stars of the movie helped make their character's iconic to audiences. Unfortunately this time around the kids won't be the focus of the movie, as it will instead focus on their return to the town they grew up in as adults. Its a very interesting concept as the adult Losers Club will now have to face off against Pennywise again, much like they did in the Stephen King novel. The original director Andy Muchetti is back for the sequel, and he's put together an impressive cast and the adult Losers including Jessica Chastain, James McAvoy, and Bill Hader. The child cast will also apparently be returning for flashback scenes, but it will be an adjustment not getting to see them on screen together for the whole movie. One can only hope the adult actors bring the same chemistry and personality to these characters that their predecessors did. DC hasn't shied away from the fact that they're trying to distance themselves from the dark tone Zack Snyder had originally set for their film universe. Shazam seems to be the polar opposite of that, which was obvious as soon as sitcom star Zachary Levi was cast in the lead role. The movie was already under some criticism for the casting choice and leaked set photos of the suit, but the Comic-Con trailer finally settled a lot of those concerns. Essentially this movie is Tom Hank's Big but with the main character turning into a superhero, with a lot of the same funny elements and light tones in it. Levi has the fun personality and charisma Hanks did in Big which just suits what they're going for perfectly, and makes it much more believable that there is a kid under that suit. While certain aspects of the movie such as its villain don't seem as impressive, the tone of the movie and chemistry amongst the younger cast is already enough to sell me on this movie. Whether you feel its necessary or not, The Lion King is finally getting the live-action remake we've been expecting these last few years. Thankfully, the trailer has already shown that it won't stray far form the original, recreating many of the iconic scenes from the animated movie with very impressive CGI. Jon Favreau is behind the camera for this project, and is someone who has already proven he knows how to adapt classic Disney stories like he did with Jungle Book. The cast is also very impressive with Donald Glover, Beyonce, Seth Rogen, and Chitwetel Ejoifor all taking on iconic roles. They've also brought back James Earl Jones as Mufasa that definitely wouldn't have been easy to recast. The trailers visuals and nostalgic callbacks are what really sold me on this movie, and the fact that its an adaption of one of my favorite animated movies of all time is also a huge plus. These movies are literally my childhood. I have mixed feelings about this one, given that in my opinion the original trilogy is flawless. I'm not sure where they're going story wise with this one, and if they're really going to be able to justify a fourth movie after what already seemed like solid conclusion. In the end its still a new Toy Story movie, and just to hear Tom Hanks and Tim Allen as Woody and Buzz again is enough for me to buy a ticket. The trailers so far have given nothing away other then a few new characters (Who hopefully win me over), but Allen has already teased just how emotional the last scene of this movie is. If there's one things I know these movies can pull off, its making adults cry. This is a tough one. Like most fans of the Star Wars series, I didn't exactly appreciate all the twists of Rian Johnson's The Last Jedi. While I didn't have the strong hatred for the movie most of the fan base had, there was certainly a sense of disappointment over the abrupt new path the series was taking. But how could I still not be excited for the last movie in the all new Star Wars trilogy. I'm of course not excited as I'd hope to be at this point in the trilogy, but there's still unanswered questions and surely surprises we can expect at the conclusion or Rey's journey. But what really has me excited is JJ Abrams returning to the director's chair, where he can finish off the vision he originally had for these movies back when Force Awakens came out. This movie honestly sounds like every mafia film fans dream. First of all its directed by Martin Scorcese, but it'll also star Robert De Niro, Al Pacino, and Joe Pesci. While those are the biggest names involved, several other actors are also included such as Bobby Canavale, Ray Romano, and Sebastian Manascalco. It'll be an adaption of the real life story of Jim Hoffa, and will de-age the main stars in order to cover the important moments of their lives. The only big reservation about this movie is that it'll apparently be released by Netflix, and still doesn't have a release date. Robert De Niro has said the film will be getting a theater release at some point, but one can only hope the fact it's being made for a streaming service won't water down the final product. De-aging technology can also be a hit or miss, and if done obviously can be a huge distraction from the story of the movie. Minus those concerns, its hard to not be excited for this movie with all the talent involved in front of and behind the camera. So if that cat wasn't out of the bag already, some how Spider-Man is coming back after "dying" in Infinity War. With a sequel already announced and set for release next year, it'll be interesting to see just how much the events of the last Avengers movie had an effect on Peter. Is Tony Stark alive to make into the Spider-Man sequel? We still don't know. What we do know is the events of the movie will be taking Peter and his classmates like Ned, Michelle, and Flash to different locations in Europe. But whats probably most exciting about this movie is the use of the villain Mysterio, who like Vulture in Homecoming, we still haven't on the big screen. If the visual possibilities of that alone weren't exciting enough, Jake Gyllenhaal will be the one under the fish bowl head. Director Jon Watts has already proven once he knows how to do Spidey's rogue gallery justice, and it seems like this time will be no different. Don't act surprised. The movie that will probably be at the top of every movie goers list of their most anticipated of the year is this one right here. With the cliffhanger ending of Infinity War, and the Russo Brothers leaving all of us shrouded in mystery over whats going to happen in this movie, April can't get here soon enough. While Infinity War was more of the grand spectacle and the large team-up movie we were all expecting, Endgame will apparently be a much more self contained and emotional movie. With pretty much only the main Avengers from the first film still alive, we know that somehow Scott Lang and Captain Marvel will also be joining the adventure and will play significant roles. The movie is also rumored to feature time travel to the events of the previous movies in order to stop Thanos, which is something that has been hinted at in leaked set photos. We're just going to have to wait and see where the Russo's decide to end this spectacle, and if everyone is going to make out alive. So do you agree with my list? 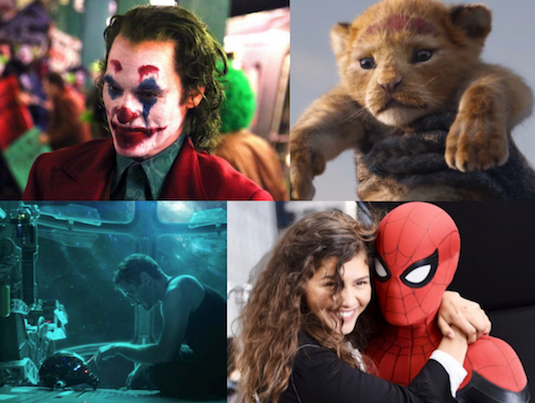 What are your most anticipated movies of 2019? Let us know below!